A person who maintains, speculates, or advances: that the Supreme Reality of existence, the Ultimate Cause of God, alternative extradimensional spiritual realities, the essential nature of things are unknown and unknowable ~ that human knowledge is limited to direct interactive immersive experience. Agnosticism, as one's declared principal position, concerning the question of what is the Ultimate Truth about God, existence ~ hyperdimensional / extraterrestrial advanced life-forms, UFO's, etc... and as one's starting point on their epic spiritual / existential journey, quest, exploration, makes the most sense and is more logical, (in our opinion), than any other epistemological posture. That is, it makes the most compelling and rational sense... until a seeker directly observes, experiences, and interfaces with a sufficient, conclusive amount of extremely persuasive, apodictic, visible evidence that highly-advanced, supernatural, interdimensional, angelic god-like entities actually exist.... that other ethereal hyper-dimensionality, not visible to the carnal eye of man or detectable by man's gadgetry, also exist.... and evidently is where the interdimensional deiforms originate from ~ (based on what they have told us through direct communication and the appearances of the aerial phenomena they have presented us with ~ in which the luminous angelic hyperspace anomalies make certain beyond any reasonable expositive doubt that all who witness these extraordinary aerial displays, immediately conclude there is no plausible subterfuge, artifice, or scenario in which they could be observing any type of man-made aircraft ~ where they seem to blink in and out of our physical reality ~ one moment they are there and then right before your eyes they simply disappear). ​It is undesirable to believe a proposition when there is no solid ground or foundation whatsoever for supposing that it could be true. Fortunately ancient hyperdimensional hierophants who have decided to support the Spiritual Awareness Project provide our apprentices with incontrovertible radically transformative, revelatory, hermeneutical evidence ~ immersive interactive experiences with them into alternative exotic fifth-dimensional hyper-realities ~ highly epiphanic and cathartic close-encounter episodes and intimate spiritual intercommunion that will not only accelerate the evolution and elucidation of universal spiritual consciousness, but expand and rearrange your entire paradigm, lifestyle, mindset, and perspective of reality. 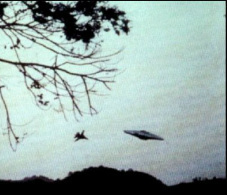 We simply ask agnostics if they would like to go out with us and see a "UFO." It is totally up to you to figure out who and what you are dealing with, and how far you want to take it. Most people are frightened to some degree ~ understandably... and they never return after seeing the UFO's for the first time. We do not force any teachings, dogma, or beliefs on you, although we try to answer any questions you have if we are able. It is all up to you how far you go with this project and how much progress you make. The ultimate goal of course is to become fully awake, transformed ~ enter into God-Consciousness and experience the genuine spiritual rebirth... be adopted into the holy spiritual family by the elders and receive an interdimensional shape-shifting glorified body ~ to be blessed, rewarded with eternal life upon exiting the primitive, matter-oriented, physical dimension as you conclude your sojourn through this high-density, insular, delusional, three-dimensional, corporeality.